You’re involved in Football but with the actual game, not the surroundings. You’re either a coach, a player, a director or you take part in any other role, and the only thing that you want to hear from your medical staff is WHAT the problem of the player is and WHEN will he return. Well, most of the times these answers aren’t in a black&white scale and you’ll have to learn the different shades of grey that lie in-between. Technical names aren’t usually the easiest way to communicate if you’re not familiar to them, but you also don’t want to simply be told that the player has got an injury to the knee (e.g.). The key for good communication is to share the same language and to respect both sides knowledge, in order to build an actual exchange of information. If the previous statements apply to you, then the ABC OF FOOTBALL MEDICINE® will be your next best friend. This section will aim to empower and educate the non-medical community in Football, to facilitate the communication between the different departments that compose ONE Football team. What impact do injuries have in football? 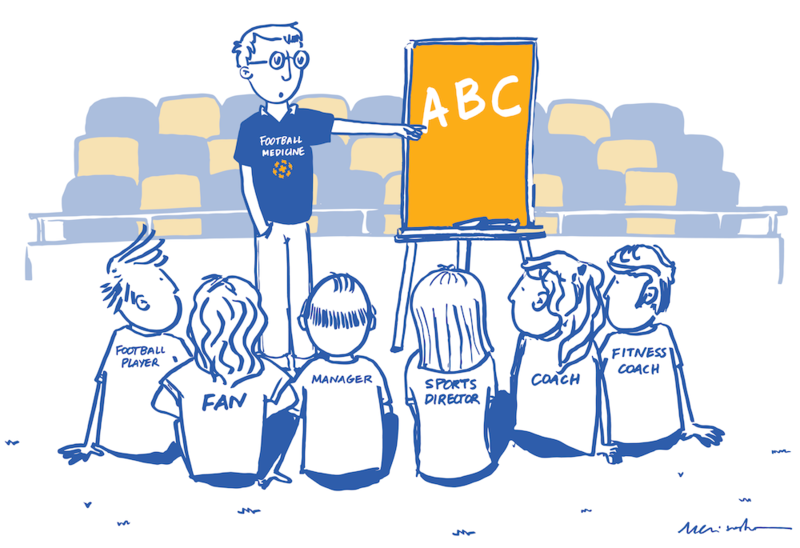 Today is the kick-off to our section the ABC of Football Medicine®. Since our group is composed by elements of medical departments, the reader might be expecting us to start with relevant content, such as injury prevention, recovery strategies, injury risk monitorization, among other. 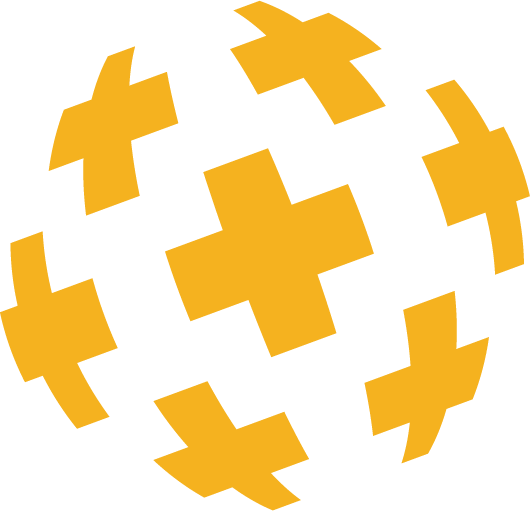 If you’re disappointed by the tittle of this first article, don’t quit just yet; all the above-mentioned themes (and many more) will be addressed during this project. However, and since the goal of this section is to share, in a clear and casual language, the common concepts and knowledge between the diverse types of professionals in football, it is crucial not to ignore key steps. Therefore, we’ll start from where we are supposed to start: the beginning. Time is a valuable and scarce resource and a big part of our professional success is directly connected to how we make the most out of the time we have available with our athletes. This is one of the reasons that makes it essential to understand the injury distribution in football, in order to ration our resources to the structures that are most often injured or that imply a longer absence of our athletes. 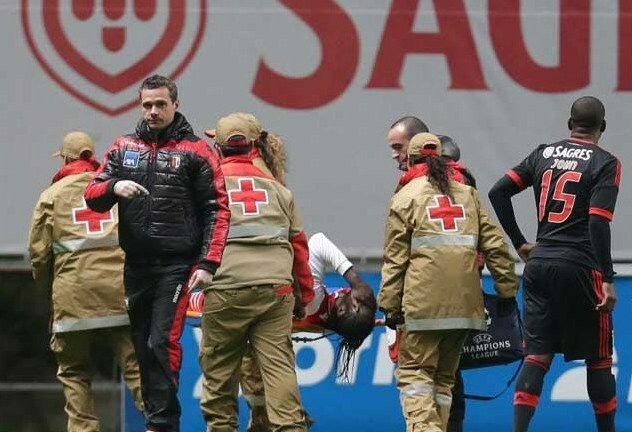 It seems clear that it is of extreme importance that the first step is to understand that, to improve the health condition of the athletes in football, first we need to know what the typical injuries of this sport are, as well as the incidence of the most relevant ones. 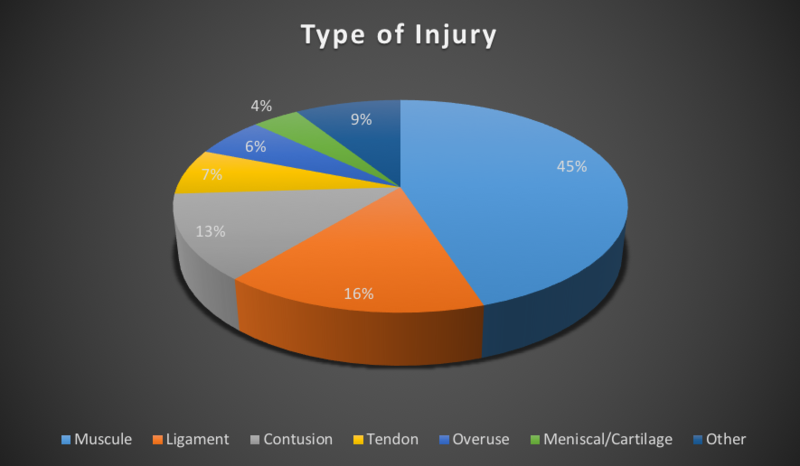 Characterizing the injuries in Football. The term “injury” will always go along with sport; although we can decrease its rate through preventing strategies, unfortunately, we will never be able to eliminate them. In football, the term is defined as “any physical constrain resulting for a training session or a match, whether it needs medical care or whether it implies absence of sport activities”. Every sport leads to increased injury risk and football is no exception. 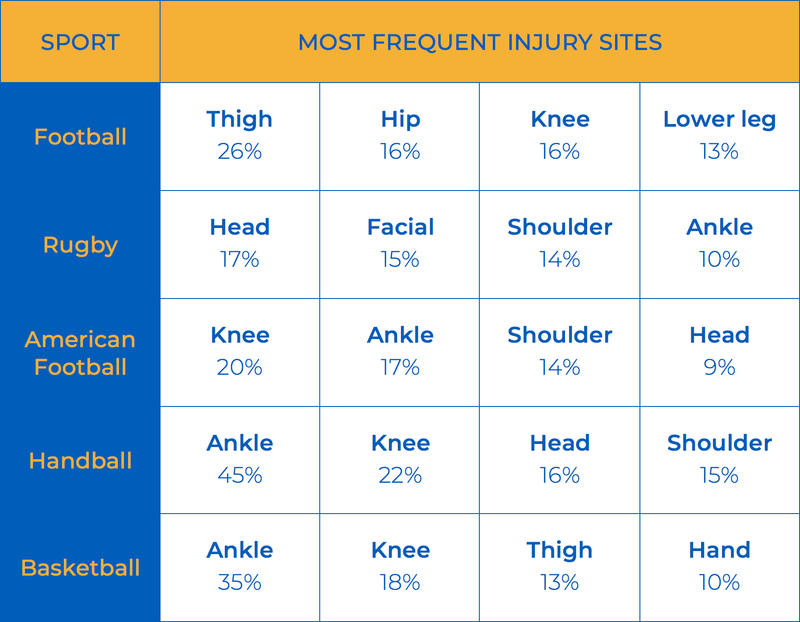 However, the distribution of the site of injury differs largely depending on the type of sport, as can be confirmed in Table 1. A lot of what is currently known regarding the epidemiology of football injuries is due to the work of the UEFA Elite Club Injury Study Group, led by Jan Ekstrand. This is a fundamental tool to give a context to the injuries in football. The following data refers to the season 2015/2016 and it shows the teams that were involved in the UEFA Champions League. We must point out that these numbers represent an average, meaning that, for example, some clubs have an injury rate quite bellow the average, while others have the opposite behaviour. 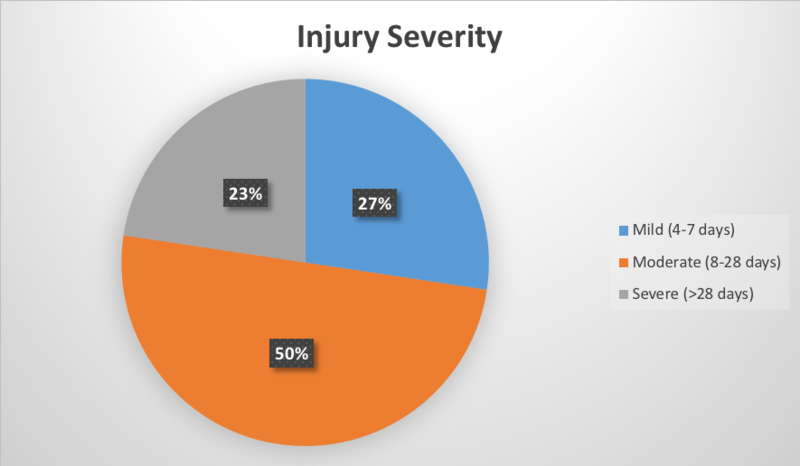 Therefore, if your own statistics of injury don’t correlate to the average here shown, dedicate some time to reflect on your methodology and understand what strategies you can implement to get closer to the clubs that show the lowest injury rates. 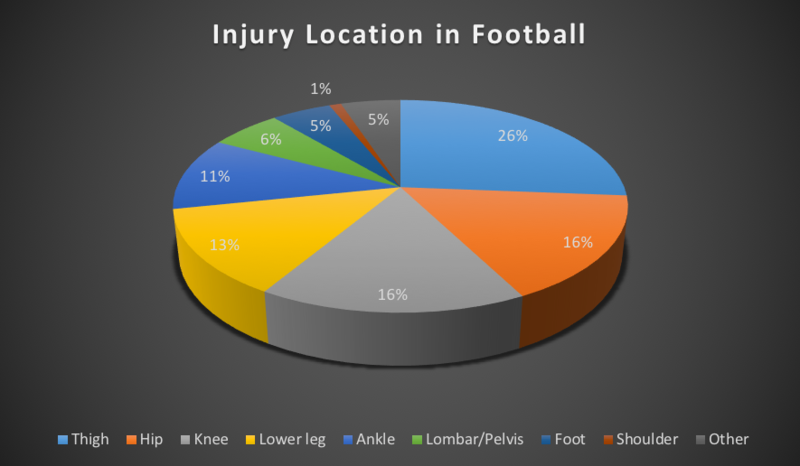 Data shows that, on a football team with 25 players, there will be an average of 50 injuries per season. This means that there is an average of two injuries for each player of the team! However, as we’ve pointed out previously, this injury number doesn’t have an even distribution. In the next image, you can notice that the lower limb is clearly the most prone to the occurrence of injuries in football. From these, the injuries to the thigh stand out as the most frequent. Football is characterized as an intermittent sport, with peaks of high intensity being followed by periods of low intensity. This makes it easy to perceive that the athletes muscle will have a high demand. This is one of the factors that turns muscle injuries as the number 1 problem in football, as we can confirm in Figure 2. However, muscle injuries aren’t a problem that solely affects football players. All the sports that require high magnitude contractions in order to express high rates of strength, speed and power are affected by this challenge (e.g. sprinters, American football, rugby, Australian football). Due to its impact, not only in performance, but also in the financial aspect of clubs, the muscle injury will be the theme that we will be exploring further in this chapter. The muscles of the posterior of the thigh are the most frequent injured in football. These muscles have crucial importance in the physical requirements of football for several reasons. Not only are they responsible for developing the horizontal force during the run (contributing to the running speed), they are also responsible for decelerating the lower limb during the swing phase, with its solicitation reaching the maximum when the athlete reaches 80-85% or more of its top speed. With that said, we can infer that the moments of high speed running and sprints will contribute largely to the incidence rate of injuries in football. Jan Ekstrand research group has been showing exactly that, demonstrating that the most common injury mechanism is running/sprint (as we can see in Figure 4). We have to point out that injuries related to this mechanism don’t exclusively refer to these muscles, since it is also an injury mechanism to other type of muscle injuries (as rectus femoris, triceps surae, among others). Identifying the injury mechanism is, therefore, one of the most important procedures after an injury occurs, since it may be a prognosis indicator, it may help to elaborate the progression criteria during rehabilitation and, ultimately, the return to play criteria. This topic will be approached in a chapter further on. Another relevant finding in the UEFA studies are regarding the average number of absence by athletes, due to injury. About 42% of the athletes take between 8 to 28 days to be back in competition (as seen in Figure 5). This affects the clubs with severe impact when it comes to performance and finances. Some of the findings of the UEFA study allow us to wonder and reflect if, at a first glance, there appears to exist a lack of monitoring of the loads (regarding training and match loads), of the recovery and/or of the athletes’ robustness. These researchers found that, although the major slice of the injuries in football have a traumatic origin (63%), injuries due to overload represent rates around 37%. This data shows the need of enhancing control of the load variables in football athletes, and the investment in strategies that allow for monitoring, plus strategies that promote the development of the robustness of the athletes through complementary programs (e.g. : Training the physical qualities of athletes). 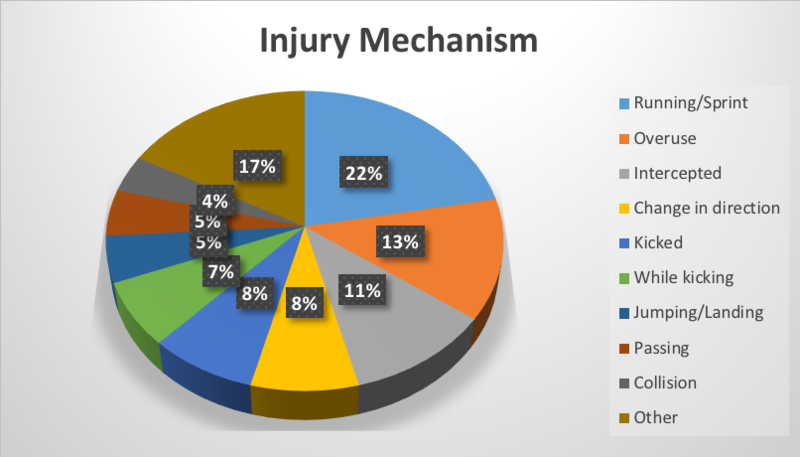 When the distribution of the contact and non-contact injuries is analysed, the results are overwhelming to say the least: 833 non-contact injuries and 315 contact injuries (UEFA Championship League 2015/2016). The numbers reinforce the key message of the last paragraph: the need to develop the monitoring of load, recovery status and robustness. Traditionally, it is assumed that non-contact injuries are the easiest to be prevented through the implementation of an injury prevention program, however, as we’ll show in chapters ahead, there are strategies that may take a role relating to contact injuries as well. In summary, injuries in football are unavoidable but it’s incidence rate can be positively affected by the strategies that promote monitoring of load and recovery and by strategies that focus on developing the robustness of the athletes. The muscle injury is considered to be the number 1 problem in current football, being the injury with the highest incidence. For this reason, the next chapter will be exploring this topic, allowing us to get acquaintance on this problem and beginning a journey that will take us to understand the strategies to adopt to lower the probabilities of these events.